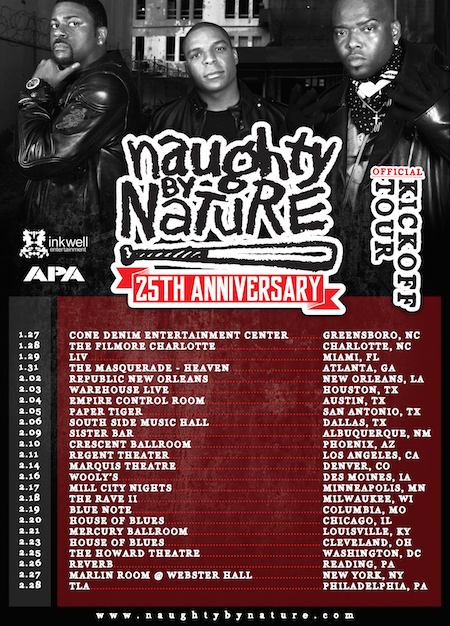 Grammy Award winning, platinum-selling hip-hop trio Naughty By Nature are back in full force, announcing their 25th Anniversary Tour that is set to hit 26 major cities across the U.S. in 2016. After kicking off the international leg of the tour earlier this month, the group will return to the states on Jan, 27 kicking off in Greensboro, NC. For more information, please visit: naughtybynature.com. When asked about celebrating 25 years of their career as a trio, Naughty By Nature said: "We're recording a new project, got that classic merchandise, we are a legendary brand and group. We put on one of the best live shows in the business, and after 25 years we are still here,"
New Jersey natives Naughty By Nature took the hip-hop scene by storm in 1989, originally calling themselves The New Style. Comprised of Vin Rock, Treach as well as DJ Kay Gee, the trio immediately garnered the attention of fellow New Jersey artist Queen Latifah, who later became their mentor. Eventually the group joined her management company Flavor Unit Management and additionally signed a deal with Tommy Boy Records. In 1991, they unleashed their self-titled debut album as Naughty by Nature and quickly assaulted the music charts. Since then, the group has maintained an undeniable track record — creating hits and party anthems that have become the soundtrack to our lives. The trio went on to produce follow-up albums that have become a part of America's hip-hop legacy: 19 Naughty III, Poverty's Paradise, Nature's Fury and Anthem Inc.
"The greatest show on earth is not a circus, it's a naughty hip-hop circuit. Twenty-five years in the game and the golden anniversary is hitting the USA with an iconic invasion. We perform with the energy like it's our last show but it ain't! Get your tickets early! You've been warned!" Treach said. If the 90's proved anything, it's that we're down with "O.P.P." — the group's debut single, which was one of the first rap songs to ever hit #6 on the Billboard Hot 100 and dubbed one of the 100 best rap singles by The Source. VH1 presented them with a "Hip Hop Honor" alongside other prominent artists such as Rakim and Eazy E.
The trio additionally won an American Music Award for Favorite New Rap/Hip-Hop Artist. Naughty By Nature has recently appeared on Late Night With Jimmy Fallon, MTV, VH1, BET Hip-Hop Awards, and has since began performing sets with The Roots, bringing a live band element to their shows for the first time in their history.